In the desert realm of Kad, a deadly epidemic strikes the palace of Sultan Kuramos. Only a mystical healer from an enemy land may have the skill to save his household. He never imagined that healer would be a woman. Varene finds her own surprises in Kad. She expects the sultan’s arrogance, but not his courage or his selfless care of the ill—or the possibility that the epidemic is the curse of a vengeful goddess. Kaddite culture condemns Varene’s mystical talents and her presence triggers a plot to overthrow Kuramos. Yet as he and the healer toil for the cure, he loses his heart to her. She falls for him as well, but how can she relinquish her homeland and her principles for him—especially when he already has a harem and his family may be cursed? 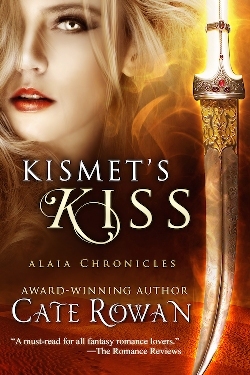 Kismet’s Kiss is a two-time Romance Writers of America Golden Heart finalist, a 2010 nominee for Best Debut and Best Fantasy Romance from The Romance Reviews, and a winner of the Duel on the Delta, The Molly, and the Put Your Heart in a Book contests. Varene blinked. “In Kad?” She fought to keep her heart from quickening. Her hands wrapped her glass. “Teganne’s my home. My life is there.” And you are not. I need that peace. For a stunning moment his green gaze seemed to yearn, but it had to be a trick of the failing light. He wants me to stay as a Healer, she thought. Not as a woman. Her heart curled inward. She turned away and leaned on the rail. The sun shafted one last ray above the horizon and then rolled from sight. Night had fallen, and her world had fallen with it. On the lower deck, servants lit small torches as people continued to talk and dance. On the upper deck, the gathering dusk cloaked Varene and Kuramos from anyone else’s gaze. Floorboards creaked as he moved closer. All her senses blazed. He stopped behind her—near enough for her to smell the exotic scent of his skin and feel his breath fan across her nape. Her pulse hammered in her wrists as she clung to the rail. “Most of the time.” She put a self-conscious hand on it and accidentally brushed his fingers. She pulled away as if shocked by sparks. He tugged at the band, releasing it. She heard a tiny thump as he dropped it on the table. His fingers slid into her hair, then let the tresses fall away to glide across her shoulders, her back, her breasts, trailing her skin like a thousand kisses. There was no safe answer. “It’s not the lilies along the rail that you’re smelling?” How could he not hear the pounding of her blood? “It’s you.” His finger traced the rim of her ear, skimmed her neck and across her collarbone. She moaned, wondering what his other fingers could do if she gave them leave. Her breath quickened in the darkness. So long it had been, so very long. Warm palms wrapped her waist and turned her until her breasts slid against the planes of his chest and her body cupped his hardness below. The long, smooth expanse of his muscled back heated her exploring fingers. She looked up into his eyes, dark in the twilight and reflecting the flickers of the first stars. They’d started this way, three days before in the market. Where would it end? Here, her conscience urged. Now. Walk away. But her traitorous body wouldn’t leave him. Her blood sang when she was in his arms. She shivered at his words, at the answer within her. Cate has washed laundry in a crocodile-infested African lake, parasailed over a Mexican beach, swum with dolphins in the Florida Keys and had Costa Rican monkeys poop in her hair, but her favorite adventures are in story worlds. Her lush fantasy romances about magical deeds, danger and true love in realms near and far have won more than thirty awards. She lives in the wild Rocky Mountains of Colorado with the love of her life and their four rescued feline furchildren, and counts it a good day when she sees red foxes playing in the yard. Links to Cate’s website, blog, books, etc. Don’t miss the chance to read this book! Thanks, Cate, for sharing your story with us!